Terrorist attacks, mass shootings, and war – security is the defining issue of our time. It is a huge challenge for us all. Every man, woman, and child has an inherent need to feel safe. The floods of refugees currently entering Europe are a clear indication that this is an innate part of human nature that transcends borders. In the telecommunications sector, it was Snowden who brought the topic of security to the attention of the entire industry in 2013. The widespread outrage sparked when he revealed how easy it was to record conversations at will and to steal data was followed by a period of growing uncertainty. It was ultimately discovered that data thieves were not only acting covertly, but that there was an entire system dedicated solely to stealing data and listening in on telephone calls. Individuals feared they had lost their right to communicate freely, companies expected or, in some cases, even suffered substantial financial losses, and high-ranking politicians saw the contents of confidential telephone calls suddenly being made freely available online. The sparkling new world of digital communications, which had previously opened so many doors, had been dealt a serious blow. These developments prompted a rapid growth in the demand for solutions capable of protecting mobile communications. And this is precisely where Düsseldorf-based Secusmart GmbH came in. Secusmart had already dedicated itself to the protection of mobile voice and data communications before the Snowden scandal broke. 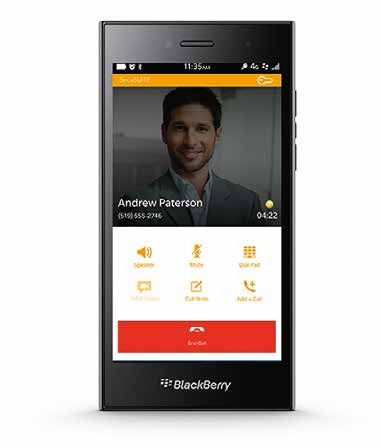 Today, the BlackBerry subsidiary is a world leader in the development and implementation of solutions in this field. Secusmart’s anti-eavesdropping solutions stand out for their combination of security and user-friendliness. Each of the company’s products aims to enable users to share delicate information securely, while using their cell phones in the same convenient way as usual. Secusmart gives every office the chance to benefit from highly secure communications. In this spirit, it will also enable German authorities to ensure that their communications are protected and not tampered with during the 2017 election year. In the wake of recent suspicions of manipulation regarding political decisions, there is a crucial need for tighter security. Besides the convenience of being able to access Secusmart’s highly secure technology on their familiar mobile devices, Secusmart’s clients enjoy a host of other advantages. For example, Secusmart not only boasts years of experience in developing security solutions, but also operates globally through its parent company, BlackBerry. Secusmart has also established a close partnership with Samsung. As part of this collaboration, it has developed a product that enables leading politicians to make secure calls and safely share data using the latest generation of mobile devices running the Samsung Knox security platform. By working with experienced partners, Secusmart is able to provide a crucial extra layer of security. 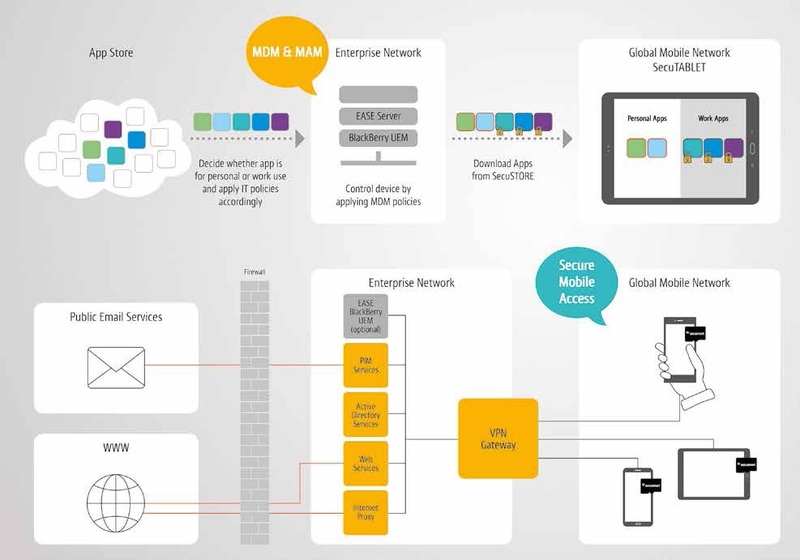 For example, the Samsung Knox security platform and BlackBerry’s EASE (EASE Server) mobile application management system work together in Secusmart’s SecuTABLET to provide access to both official apps for working securely and on-the-go and personal apps. The EASE Server allows users to retain complete control over their personal and official apps. SecuSUITE for Samsung Knox gives users all the features they need to protect their cell phone calls and to work securely when away from their desks. Moreover, the solution enables personal apps to be used in accordance with the strict security requirements of German federal agencies. This means users also have access to a wide range of Android apps, including Twitter, Facebook, and WhatsApp. The cutting-edge Samsung solutions represent the next chapter in Secusmart’s story of success, which has also seen it provide German federal agencies, ministries, and other official bodies with solutions for secure mobile communications for more than eight years. German politicians use SecuSUITE for BlackBerry 10 to protect their calls and to share data safely. Meanwhile, Secusmart’s international SecuSUITE for Government high-security solution safeguards the mobile voice and data communications of more than 20 governments worldwide, also shielding personal data, such as calendar entries, contacts, and notes from third-party attacks. With its SecuTABLET, Secusmart combines all the features needed for users to work securely on the go with the familiar level of convenience provided by a standard Samsung Galaxy Tab S2. SecuTABLET has been provisionally approved by the German Federal Office for Information Security (BSI) at the German VS-NfD (classified – for official use only) security level. The device also enables users to communicate securely according to the SNS standard. Dr Christoph Erdmann is founder and Managing Director of Secusmart GmbH and head of Technology and Product Management. A specialist in digital voice processing, he holds numerous patents and has produced various publications in this field. In 2006 he was awarded the Borchersplakette by the RWTH Aachen for his exceptional scientific work. While there, he also wrote his dissertation, for which he received the renowned E-Plus award in 2004. Prior to founding Secusmart GmbH, he worked as Technology Manager for NOKIA.